Some of the most common questions I see on a regular basis are questions about what kind of plants to put into enclosures and how to take care of them. 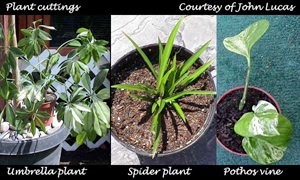 There are many benefits to live plants in an enclosure. Among other things, they will add/maintain humidity, provide a natural cover and climbing area, and for some species of chameleon, serve as a food source. This article will cover some basic care needs for some of the most commonly used plants in a chameleon’s enclosure including Pothos, Ficus, Schefflera, Hibiscus, and Dracaena. All plants need certain things to live; light, water, and food are the basics. Almost all chameleon enclosures will provide light and water, although depending on the plant you may need to provide more or less water and/or light than is naturally supplied in the enclosure. The UV lighting from your chameleon lights is usually more then enough for the plants to thrive in. Some plants do not like a lot of heat and it’s a good idea to not keep plants directly under the heat lamp. When a plant is first placed into the enclosure, the lighting will be different potentially causing the plant to drop some leaves or having a decreased rate of new growth. You should not be too worried about this as your plants, like chameleons, need to adjust to new environments; especially if there new environment is very different from its last one. Watering is where most people have issues with there plants. Over and under watering can wreak havoc on your plants. Without proper drainage and the ability for the soil to expel excess water, the roots will be constantly wet causing them to rot and kill the plant. If you do have a container that has no drain holes, fill the bottom 1/3 of the container with rocks or gravel to allow the water to get out of the soil. Many people assume that with spraying and misting in there cages, the plants should be fine. The problem is, they will still dry out and still need to be watered depending on the amount and frequency of misting. A good way to tell if a plant is getting enough water is to stick your finger in the soil. It should be dry on the top inch and damp below that. This is generally a good time to water your plant but let the top 1-2 inches dry out again before watering again. If the top soil is wet don’t water. If it’s dry as far down as your finger can go, water the plant well. As general rule, your plant is better off being slightly under watered then over watered. An over watered plant is hard to save. Plants get their nutrients from the soil. It is important to have organic soil that contains no fertilizers or pearlite (white balls). Some people wonder about fertilizing there plants to help them grow, and how to do this with out toxic chemicals. Remember what you put into your plant can affect your chameleon’s health. They can potentially eat the plant, eat insects which have eaten the plant, and there is also the potential that any chemicals that were put into that plant will transfer to your chameleon. There are, however, a few things that could be done. Mixing a small amount of potato skins and/or other organic materials into the soil once or twice a year will add some nutrients to the soil. Furthermore, by adding some fresh soil to the top of the planter, you can add a helpful boost in nutrient levels. This can be done once or twice a year as well. On top of this the chameleons will add there own natural fertilizer. There are also some toxic free fertilizers on the market but make sure to research these before using them. When in doubt do not use them! Cleaning your plant may seem like a weird thing to do but it is sometimes necessary. Residue can build up on the surface of the leaves effectively rendering the leaf useless to the plant. Dust, water residue, and dropping leftovers can all cover the leaves. If you notice your plant is “dirty” a shower might help. Put the plant in the shower and mist the leaves (or wipe them down) with a mixture of dish soap and water. After a good misting of the leaves, rinse very thoroughly in the shower. Cleaning is a good idea before you put any new plant in your chameleon’s enclosure as it will help ensure that any pesticide or fertilizers that have been used are removed. Plants will also need to be repotted on occasion. Some plants do well with being root bound and some do not. Usually when a plant is bought it will need to be repotted, generally in a pot that is two inches bigger then its current pot. If roots are coming out the bottom or there are more roots then soil, it is generally in need of repotting. Some plants can go back into the same container if some of the excess roots are cut off and fresh soil is added (woody plants like Ficus do not respond well to this, where plants like Pothos will). Pothos (not to be confused with philodendron witch is slightly toxic) is a very common plant that is widely used in many chameleon enclosures. Pothos can handle low light fairly well although they will loose their color contrast in low light situations. It’s good to let the top inch or so of the soil dry out before watering, although Pothos can tolerate a bit of over watering as it is very hardy. Pothos do often need to be repotted or roots cut back about once a year or as needed (check roots). If repotting move the plant to a pot that is one size larger (approx two inches bigger). If u wish to put the plant back into the same pot, remove the plant and cut off the outer layer of roots that have built up on the outside of the root ball and re pot adding some fresh soil. You will need to be careful not to remove too much of the roots and cause harm to the plant. If you want to make more plants from your Pothos you can do so fairly easily. There are a few methods to propagate Pothos. Both methods require you to take cuttings of new growth. I find it is good to cut about the length of 4-5 leaves back from the end of a vine. Remove the bottom 2 leaves and put this section into water or plant them right in some soil. The new plants will root from the areas where the bottom 2 leaves where pulled off. Rooting them in water requires one more step. Planting the clipping after it has been rooted and allowed to root itself in the soil as well. Some people use rooting hormone to help with this process. This practice is fine if you’re not planning on using the plant in your enclosure for a long time. Overall Pothos is one of the easier plants to work with. There are over 800 species of Ficus plants but with Ficus benjamina being the most commonly used, it will be the focal species. Additionally, many of the other Ficus plants can be treated similarly. 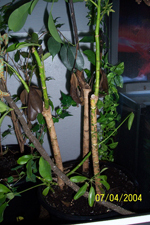 Ficus benjamina can grow up to six feet tall in the right conditions and is an excellent plant for Chameleons. Ficus plants can be a very troublesome plant for some people. They tend to drop leaves with any change and drop leaves naturally as well, this tends to scare people. Ficus do well in a place where it can get sun during the day or in a medium light area. Lack of light will cause leaves to drop and the plant to thin out. You may notice that one side of the plant has less leaves then the side facing the light. Their leaves have a tendency to burn if the temperature is too high so it is a good idea to keep this plant out of close proximity to your heat lamp(s). Ficus benjamina does not handle being under watered well (drops leaves if under watered) and does best when the roots are kept slightly moist (not wet) at all times. Only allow the top inch of soil to dry out before watering. Ficus like to be slightly root bound and too much area to fill in a pot will slow the upward growth until the roots fill in again. Only re-pot when it is very clearly in need (ex: a lot of root coming out of the drain holes and/or excess roots appearing on the top). Propagating Ficus plants can be difficult. Six inch cuttings can be taken and potted in peat moss/sand mixture in a three inch pot. Again rooting hormone can be used to help with this process, if you’re not planning on using the plant in your enclosure for a long time. Cover these cuttings in plastic to make mini green houses (large freezer baggies work well for this), and placing them in a bright filtered light area (not direct sunlight). New growth on the plants will indicate they have rooted and can then be repotted in a 4 inch pot with normal potting soil and treated the same as mature Ficus plants; this can take up to 4 months. There are other ways of propagating Ficus but they are very advanced and take some skill to master. Special notes on Ficus: cleaning is usually necessary to keep leaves clean, and cuts will produce sap witch is irritating if exposed to the eyes of your chameleon, make sure cut plants are healed before returning to the cage. Commonly know as the umbrella tree or dwarf Schefflera, Schefflera arboricola is another favorite plant to have in a Chameleon enclosure. It is important not to confuse this species with Schefflera actinophylla, however as it is actually toxic. Schefflera arboricola is either loved or hated by people. One of the main reasons some people have issues with it is lighting. This plant requires a lot of bright light with some direct sunlight throughout each day. Some Chameleon cages, while being light well, are usually only light well form the top. The plant will shadow the bottom with its umbrella leaves and thin out, become unnaturally long, and look very flimsy and unattractive. Proper all around lighting is needed for this plant in order to keep it nice and full. When watering this plant allow the top inch to dry out between watering. This plant does not like to be wet at all, so watering small amounts over time is better then one big watering. The soil should always be damp but never wet with this plant. Repotting one size up as needed and when desired pot size is reached all that is needed is to refresh the top layer of soil a few times a year. Propagation can be achieved by tip or stem cuttings that are 3-4 inches long taken from below the leaf node (bump or joint on stem). The node does not have to have a leaf on it. 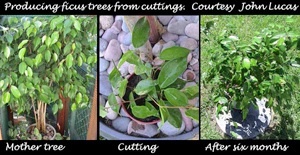 Cuttings can then be treated the same as the steps in the Ficus description (see above), with the added note of being placed in a warm window (65 º -75 ºf). Cleaning the leaves can be beneficial to Schefflera. Hibiscus is a beautiful plant that can grow to six feet tall and is known for its beautiful flowers. This plant can be a vigorous grower and constant pruning may be needed to keep desired size. Flowers are common in spring and summer and can occasionally bloom throughout the rest of the year. Hibiscus needs bright light with some direct light throughout the day. An extra step is needed with hibiscus to keep it at optimum health. For two to three months during the winter lowering the temps to 55 ºf for a winter rest will benefit this plant and aid in blooming ability in the spring and summer. While the plant is in its rest period water just enough to keep roots from drying out. During the rest of the year allow the top half inch to dry out between watering. Repot when needed to one sized up, and when desired size is reached replace top soil a few times a year. To propagate Hibiscus take cuttings that have a strip of bark attached (this can be done by cutting 90% of the cutting and ripping down to gain the “heel” strip of bark). Then treat the same as propagating Ficus (see above). Pruning is preferred in spring. Dracaena has many forms and most are treated similarly. Bright light is needed, but they do not like direct sun. Dracaena will do well in a medium light situation although it will slow its growth. Moist soil should be maintained but never wet as root rot will quickly occur if left too wet. This plant does not need frequent repotting since their roots tend to stay small. Only repot as necessary. Cleaning leaves is easy with this plant as the leaves are generally very long. There are lots of plants that would be great for chameleon cages. The aforementioned species are commonly used plants. It’s my hope that these tips help you have success with your plants. When choosing a plant for your chameleon it is important to make sure to use nontoxic plant species and to look at the individual needs of your plant. If you have any questions or comments please let us know.